The second burger for day 2 of Happy Meal's Spring Break in Las Vegas was Broadway Burger Bar and Grill. This was located the tidied up version of SOHO--Faux Ho. Honestly, Happy Meal and I preferred this version of NYC to the real thing. We were in NYC recently, and he mostly noted the crowds, unpleasant smells, chewing gum everywhere, and lots of trash blowing around. Apologies to my thicker-skinned NYC readers. This is excerpted from their site, "...Broadway Burger Bar & Grill located inside the Village Streets at NYNY is not only the best tasting burger, but is one of the healthiest burgers you will ever try! Our burgers come straight from the Estancia Farm in Uruguay and are 100% Free-range, grass fed, Estancia beef. Our burgers are high in Omega 3 and Vitamins A&E. These all natural, no hormones, no antibiotics burgers aren't just good for you...they are delicious too!..." We were seated promptly. We spoke with Shane, the manager, and he gave us the lowdown on the burgers. Happy Meal was in the mood for pizza, and the folks at Broadway Burger Bar and Grill were kind enough to allow him to bring in a slice while I tried a 1/2 pound burger. I ordered a plain burger withe American cheese and waited for a good long while. 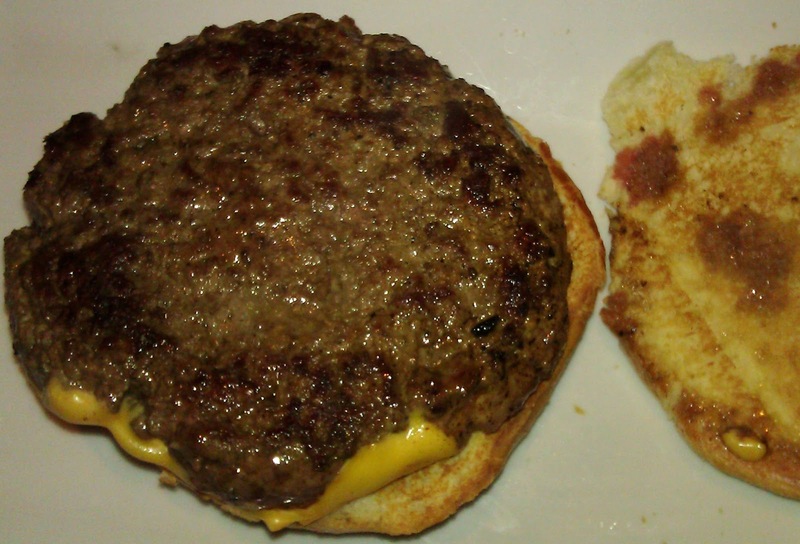 On the first attempt, the burger came out overdone. I sent it back, and on the second attempt, it came out a perfect Medium. They were kind enough to comp the burger due to the long wait time. During that wait, Happy Meal had a Chocolate Therapy shake that Broadway Burger Bar and Grill obtained from the nearby Ben and Jerry's. This shake was the highlight of his day! The Beef: Wow! The burger beef from Estancia was complex. While it was mostly Chuck, the funk and depth of flavor led me to believe that a fair amount of Rib meat made its way into the blend. That part of the cow is adjacent to the Shoulder/Chuck, so it seemed a fair guess. The beef was cooked to a perfect, pink, juicy, and tender Medium. The organic, grass-fed burger meat was rich with beef flavor, funk, and some mineral notes. This was a burger for adults, and Happy Meal wrinkled his nose when he sampled it. The strong flavors did not suit his palate, but I was a fan. The fat content was right about 20%. The burger was juicy to the point of almost being messy. I found it especially decadent that I was eating beef from Uruguay. The Seasoning: There was a light dusting of salt on the exterior of the burger. In this case, the light salt made sense, because the savory notes of the cheese filled int. The Sear: There was ring of sear on the burger. This was more impressive on the first attempt. I attributed this to a swamped kitchen where the grill was not holding its temperature. The big flavors from the beef and cheese made this an academic observation. The burger was delicious--an epic sear would have made it amazing. The Preparation: The burgers were cooked on a gas-fired flat top. The uniformly-shaped, 1/2 pound patties were formed up during the day. The patties were not overworked, so the beef was not chewy. 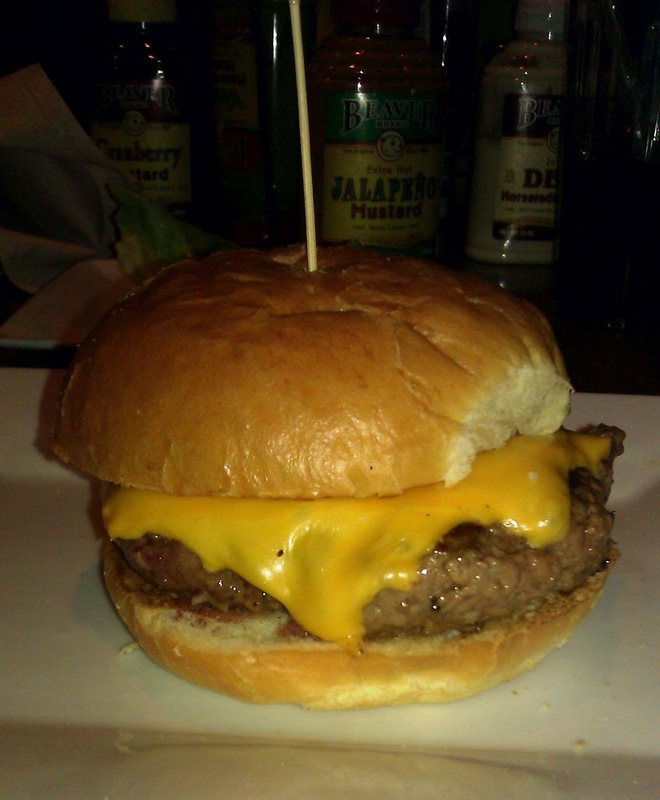 The Cheese: There were a host of choices at Broadway Burger Bar and Grill, but I go with American whenever possible. This is to be consistent, and because American cheese just plain works on cheeseburgers. In this case the American cheese worked overtime. The cheese filled in perfectly with savory flavors, iron notes, and creaminess. This rounded out the complex beef to create a nearly perfect cascade of flavors. The Bun: This was a simple brioche. It was sweet, fluffy, yeasty, fresh, and moist. The bun was nominally toasted. 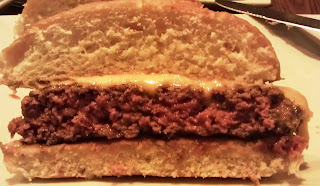 A little crunch would have been nice, but the strong flavors and tender beef made up for the lack of added texture. 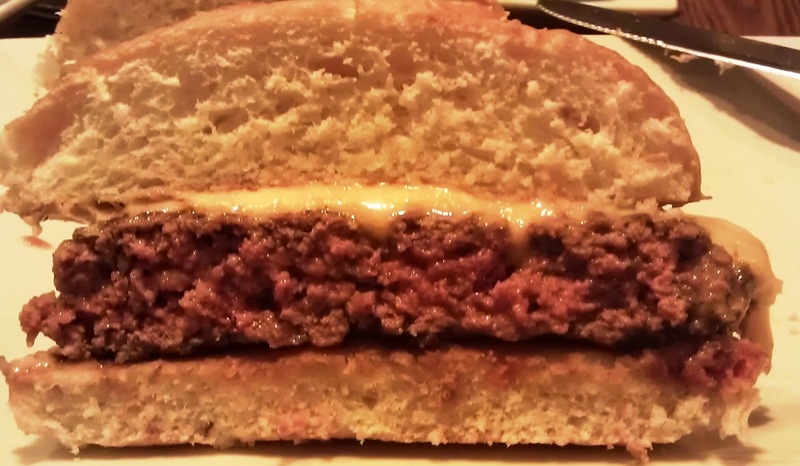 The Meat To Bun Ratio: This was just perfect. The Fries: The fries at Broadway Burger Bar and Grill were the sort of hand-cut, peel-on, hearty fries that we have come to associate with Five Guys Burgers and Fries. The fries were strong with earthy flavors. They were nicely salted. 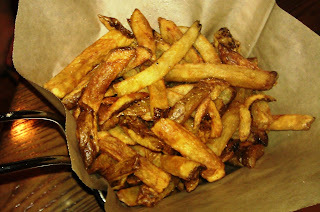 I found myself longing for the malt vinegar that I apply at to my Five Guys fries. The fries were great, and I had to fight Happy Meal for them. The Toppings: The Bibb lettuce was fresh and sweet. The tomato slices were ripe and flavorful. The Value: Broadway Burger Bar and Grill charged $14.95 for a cheeseburger, fries, and a beverage. That was a fair price considering the superlative quality of the burger meat. Broadway Burger Bar and Grill served up a surprisingly good burger. It was complex, juicy, fresh, and a fine value considering the quality of ingredients and service. Burger Review : A nearly perfect union of textures and flavors was discovered in the burger at Broadway Burger Bar and Grill. I cannot comment on the food, only the service. There was none! We waited 10 mins for a booth to be cleaned. Mind you there were only 4 tables occupied, hardly busy. When we were seated we waited an additional 15 mins for a server to take our beverage order. She walked past us 3 different times taking another tables order and just walking around. On the last pass by she said hang on guys i'll be there in a minute. Now, it's 100+ degrees in Vegas and after walking around all day and spending $ we were thirsty. My husband was so parched he even asked the barmaid for something to drink and got equally ignored. She took care of two other guests and just barked at him "i'll be there in a minute" He is a professional and is always polite, her attitude was not called for and the service was a complete failure! Finally after waiting over 20 minutes she asked what I wanted, I said just a water first, had planned on a root beer float. She huffed at me as if it inconvenienced her. I was a sever for 4 years and never once treated a guest like that! I don't understand the attitude, you work in food service, if you don't like it, find another job. Needless to say after the way we were disrespected and ignored for so long we got up and left without being able to eat. HORRIBLE SERVICE, plain and simple. No excuse, they weren't even busy! !